Alexander Calder (/ˈkɔːldər/; August 22, 1898 – November 11, 1976) was an American sculptor known as the originator of the mobile, a type of moving sculpture made with delicately balanced or suspended shapes that move in response to touch or air currents. 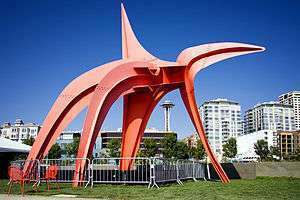 Calder’s monumental stationary sculptures are called stabiles. He also produced wire figures, which are like drawings made in space, and notably a miniature circus work that was performed by the artist. 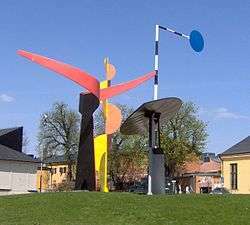 Alexander "Sandy" Calder was born in 1898 in Lawnton, Pennsylvania. His actual birthday, however, remains a source of much confusion. According to Calder's mother, Nanette (née Lederer), Calder was born on August 22, yet his birth certificate at Philadelphia City Hall, based on a hand-written ledger, stated July 22. When Calder's family learned about the birth certificate, they reasserted with certainty that city officials had made a mistake. Calder's grandfather, sculptor Alexander Milne Calder, was born in Scotland, immigrated to Philadelphia in 1868, and is best known for the colossal statue of William Penn on top of Philadelphia City Hall's tower. His father, Alexander Stirling Calder, was a well-known sculptor who created many public installations, a majority of them in nearby Philadelphia. Calder's mother was a professional portrait artist, who had studied at the Académie Julian and the Sorbonne in Paris from around 1888 until 1893. She moved to Philadelphia where she met Stirling Calder while studying at the Pennsylvania Academy of the Fine Arts. Calder's parents married on February 22, 1895; his sister, Mrs. Margaret Calder Hayes, was instrumental in the development of the UC Berkeley Art Museum. Calder moved to New York and enrolled at the Art Students League, studying briefly with Thomas Hart Benton, George Luks, Kenneth Hayes Miller, and John Sloan. While a student, he worked for the National Police Gazette where, in 1925, one of his assignments was sketching the Ringling Brothers and Barnum and Bailey Circus. Calder became fascinated with the action of the circus, a theme that would reappear in his later work. In 1926, at the suggestion of a Serbian toy merchant in Paris, Calder began to make mechanical toys. At the urging of fellow sculptor Jose de Creeft, he submitted them to the Salon des Humoristes. Calder began to create his Cirque Calder, a miniature circus fashioned from wire, cloth, string, rubber, cork, and other found objects. Designed to be transportable (it eventually grew to fill five large suitcases), the circus was presented on both sides of the Atlantic. 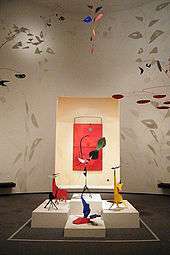 Soon, his Cirque Calder (on view at the Whitney Museum of American Art at present) became popular with the Parisian avant-garde. He also invented wire sculpture, or "drawing in space," and in 1929 he had his first solo show of these sculptures in Paris at Galerie Billiet. Hi! (Two Acrobats) in the collection of the Honolulu Museum of Art is an early example of the artist's wire sculpture. The painter Jules Pascin, a friend of Calder's from the cafes of Montparnasse, wrote the preface to the catalog. A visit to Piet Mondrian's studio in 1930, where he was impressed by the environment-as-installation, "shocked" him into fully embracing abstract art, toward which he had already been tending. The larger myth of the mobile is that it represents the triumph of kinetic sculpture, when in reality the mobile was as different as one could imagine from the original vision: passive rather than active; not at all mechanical; and random rather than directed in its motion. 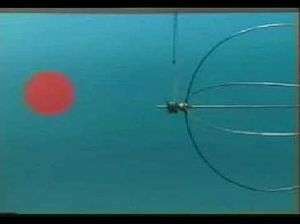 Indeed, the mobile drew upon none of the incredible technical resources of the twentieth century, the appropriation of which had of course been the principal inspiration of the original kineticists. In the 1950s, Calder increasingly concentrated his efforts on producing monumental sculptures (his self-described period of "agrandissements"). 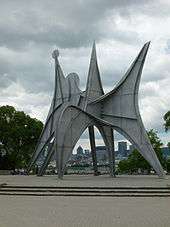 Notable examples are .125 for JFK Airport in 1957, Spirale for UNESCO in Paris 1958 and Trois disques, commissioned for Expo 67 in Montreal, Quebec, Canada. Calder's largest sculpture at 25.7 meters high was El Sol Rojo, constructed outside the Aztec Stadium for the 1968 Summer Olympics "Cultural Olympiad" events in Mexico City. In 1972, Dallas, Texas, based Braniff International Airways commissioned Calder to paint a full-size Douglas DC-8-62 four engined airliner as a "flying canvas." George Stanley Gordon, founder of the New York City advertising agency Gordon and Shortt, approached Alexander Calder with the idea of painting a jet airliner. Calder responded that he did not paint toys and Gordon told him it was a real full sized airliner that he proposed that Calder paint. Calder immediately gave his approval and George knew that Braniff International, known for melding the worlds of fashion and design with the mysterious world of aviation, would be the perfect company to propose his idea of Calder painting one of their jets. Braniff Chairman Harding Lawrence was highly receptive to the idea and a contract was drawn up that called for the painting of one Douglas DC-8-62 jet liner and 50 gouaches for a total price of $100,000. Calder's work is in many permanent collections across the world. The Whitney Museum of American Art, New York, has the largest body of work by Alexander Calder. Other important museum collections include the Solomon R. Guggenheim Museum, New York; the Museum of Modern Art, New York; the Centre Georges Pompidou, Paris; the Museo Nacional Centro de Arte Reina Sofía, Madrid; and the National Gallery of Art, Washington DC. In 1993, the owners of Rio Nero (1959), a sheet-metal and steel-wire mobile ostensibly by Calder, went to the United States District Court for the District of Columbia charging that it was not by Alexander Calder, which the dealer who had sold it to them had claimed. That same year, a federal judge ruled that for Rio Nero the burden of proof had not been fulfilled. Despite the decision, the owners of the mobile could not sell it because the recognized expert, Klaus Perls, had declared it a copy. The judge recognized the problem at the time, noting that Perls’ pronouncement would make Rio Nero unsellable. In 1994, the Calder Foundation declined to include the mobile in the catalogue raisonné on the artist. ↑ "Alexander Calder Chronology". Calder Foundation. Retrieved July 22, 2015. ↑ Hayes, Margaret Calder. Three Alexander Calders: A Family Memoir. Middlebury, VT: Paul S. Eriksson, 1977. ↑ Calder 1966, p. 13. ↑ Calder 1966, p. 15. ↑ "Calder Foundation". Calder.org. Archived from the original on July 24, 2011. Retrieved July 21, 2011. ↑ Calder 1966, pp. 21–22. ↑ Calder 1966, pp. 28–29. ↑ Hayes, Margaret Calder, Three Alexander Calders: A Family Memoir. Middlebury, VT: Paul S. Eriksson, 1977, p. 41. ↑ "Panama Pacific International Exposition". calder.org. 1 2 Petroski, Henry (September–October 2012). Schoonmaker, David, ed. "Portrait of the Artist as a Young Engineer". American Scientist. New Haven, Connecticut: Sigma Xi. 100 (5): 368–373. ISSN 0003-0996. OCLC 645082957. 1 2 "My Way, Calder in Paris" (PDF). Seymour I Toll. ↑ Calder 1966, p. 47. ↑ "Calder Biography". Calder Foundation. Archived from the original on 25 July 2011. Retrieved July 31, 2011. ↑ Calder 1966, pp. 54–55. ↑ Calder in India, 31 May – 3 August 2012 Ordovas, London. ↑ "Alexander Calder: The Great Discovery". Gemeentemuseum Den Haag. Gemeentemuseum Den Haag. Retrieved 2012-04-08. ↑ Alexander Calder Fondation Beyeler, Riehen. ↑ Alexander Calder, Romulus and Remus (1928) Guggenheim Collection. ↑ Alexander Calder, Ghost (1964) Philadelphia Museum of Art. 1 2 Alexander Calder Tate Collection. 1 2 Randy Kennedy (October 18, 2011), A Year in the Work of Calder New York Times. ↑ Alexander Calder, Untitled (1948) Christie's Post-War and Contemporary Evening Sale, 10 November 2010, New York. ↑ Alexander Calder, Seven Horizontal Discs (1946) Christie's Post-War and Contemporary Evening Sale, 8 November 2011, New York. ↑ Alexander Calder, Lily of Force (1945) Christie's Post-War and Contemporary Evening Sale, 8 May 2012, New York. ↑ Calder. Gravity and Grace, March 18, 2003 - October 07, 2003 Guggenheim Museum Bilbao. ↑ Smith, G.W. (July 7, 2015). "Swing Low, Sweet Chariot: Kinetic Sculpture and the Crisis of Western Technocentrism". Arts. Retrieved May 8, 2016. ↑ “Mobiles” by Alexander Calder, in The Painter’s Object, edited by Myfanwy Evans (London: Gerold Howe, 1937), 62–67. ↑ Alexander Calder, Le Rouge de Saché (1954) Christie's Post-War and Contemporary Evening Sale, 8 May 2012, New York. ↑ Alexander Calder, Red Curlicue (1973) Christie's Post-War and Contemporary Evening Sale, 10 November 2010, New York. ↑ "Initial Public Art Project Becomes a Landmark". 40th Anniversary Highlights. National Endowment for the Arts. Retrieved 20 June 2013. ↑ Wenegrat, Saul (February 28, 2002). "Public Art at the World Trade Center". International Foundation for Art Research. Archived from the original on September 28, 2007. Retrieved July 27, 2007. ↑ Lives and Treasures Taken, The Library of Congress Retrieved 27 July 2007. ↑ Cynthia Dizikes (October 04, 2010), Lawsuit: Sears wants Willis Tower artwork back Chicago Tribune. ↑ "History of the MCA". Museum of Contemporary Art, Chicago. Archived from the original on 25 July 2011. Retrieved August 7, 2011. ↑ Alexander Calder, Mountains and Clouds (1985) Christie's Post-War & Contemporary Art Evening Sale, 14 November 2012, New York. 1 2 Alexander Calder: Printmaker, October 30, 2009 - January 31, 2010 Bruce Museum, Greenwich, CT.
↑ Bejamin Genocchio (December 18, 2009) Beyond the Mobiles New York Times. ↑ Gordon, George Stanley. "My Pal, Alexander Calder". www.brownalumnimagazine.com. Retrieved 22 July 2014. ↑ Bissett, Mark. "The First BMW Art Car". primotipo.com. Retrieved 4 May 2016. 1 2 Cheryl Lu-Lien Tan (December 11, 2008), The Intimate Side of Alexander Calder Wall Street Journal. ↑ Karen Rosenberg (December 11, 2008), Calder’s Precious Metals: Who Needs Diamonds? New York Times. ↑ Carol Kino (December 2, 2007), Precious Metals New York Times. ↑ Roberta Smith (May 13, 2010), Shedding New Light on Old Friends New York Times. ↑ Calder Jewelry The San Diego Museum of Art, San Diego. ↑ Alexander Calder L&M Arts, New York/Los Angeles. ↑ Roberta Smith (March 27, 1998) All Calder, High and Low New York Times. ↑ Alexander Calder: The Paris Years, 1926–1933, October 16, 2008 – February 15, 2009 Whitney Museum of American Art, New York. ↑ Alexander Calder, February 8 - March 26, 2011 Gagosian Gallery, London. ↑ "Ghost". Philadelphia Museum of Art. Retrieved February 7, 2012. ↑ "Stamp Series". United States Postal Service. Archived from the original on 2013-08-10. Retrieved Sep 2, 2013. ↑ Souren Melikian (November 11, 2010), At Christie's, Mockery Brings in Millions New York Times. ↑ Carol Vogel (May 8, 2012), Record Sales for a Rothko and Other Art at Christie’s New York Times. ↑ Carol Vogel (May 14, 2014), Asian Collectors Give Christie’s a High-Yield Night New York Times. ↑ Alexander Calder - Biography Calder Foundation. ↑ "Calder Foundation website: Trustees page". Calder.org. Archived from the original on 25 July 2011. Retrieved July 21, 2011. 1 2 Carol Vogel (October 2, 1998) Calder Works On the Move New York Times. ↑ "Calder Foundation website: Copyright and Disclaimers page". Calder.org. Archived from the original on 25 July 2011. Retrieved July 21, 2011. ↑ Jacob Hale Russell (July 29, 2006), Look Who’s Selling --- Once-quiet artists’ foundations are becoming power players, The Wall Street Journal. ↑ Patricia Cohen (June 19, 2012), In Art, Freedom of Expression Doesn’t Extend to ‘Is It Real?’, New York Times. ↑ Daniel Grant (September 29, 1996), The tricky art of authentication Baltimore Sun. ↑ Stuart Jeffries (March 13, 2003), Cover up The Guardian. ↑ Patricia Cohen (August 5, 2012), Ruling on Artistic Authenticity: The Market vs. the Law, New York Times. 1 2 Somma, Ann Marie (March 12, 2006). "The Calder Work That Wasn't". Hartford Courant. Retrieved April 15, 2016. ↑ Hogrefe, Jeffrey (May 10, 1984). "Top Price For Calder". The Washington Post. Retrieved April 15, 2016. ↑ Scott Timberg (September 15, 2005), Impasse apparently scuttles Philadelphia's Calder project Los Angeles Times. ↑ Joann Loviglio (2005), Philadelphia Calder Museum Plans Cancelled ARTINFO. ↑ "Famous Artists Send Greeting Cards". MutualArt. Retrieved 2015-01-13.